Bossier City, Louisiana, resident Rebecca Cobb was recently awarded an academic scholarship by Oklahoma Baptist University for the 2015 academic year. OBU is located in Shawnee, Oklahoma. OBU Photo by Bill Pope | Bossier City resident Rebecca Cobb was recognized as a University Scholar finalist by Oklahoma Baptist University President Dr. David W. Whitlock during a recent ceremony on OBU’s campus in Shawnee, Oklahoma. 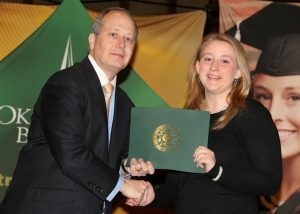 Cobb was named a University Scholar finalist, an award presented in recognition of academic achievement. Students selected as University Scholars are awarded a full-tuition scholarship for four years. Finalists not named University Scholars will receive the Founders’ Academic Scholarship, an annual $13,000 scholarship which can be renewed for three additional years, making the honor worth a potential of $52,000. A senior at Southwood High School in Shreveport, she is involved in Fellowship of Christian Athletes (FCA), First Priority, the Southwood Swim Team and Beta Club. She serves as president of FCA and as a children’s ministry intern at her church. She expects to graduate as valedictorian in May and major in applied ministry at OBU. She attends Cypress Baptist Church of Benton, Louisiana. OBU President Dr. David W. Whitlock presented a certificate of recognition to each 2015 academic scholarship recipient during a recent ceremony on OBU’s campus in Shawnee. With campuses in Shawnee, Oklahoma, and Oklahoma City, OBU offers 10 bachelor’s degrees with 86 fields of study and four master’s degree programs. The Christian liberal arts university has an overall enrollment of 1,979, with students from 42 states and 30 other countries. OBU has been rated as one of the top 10 regional colleges in the West by U.S. News and World Report for 23 consecutive years and has been Oklahoma’s highest rated regional college in the U.S. News rankings for 21 consecutive years. OBU is one of three universities in Oklahoma and the only private Oklahoma university listed on Great Value College’s rankings of 50 Great Affordable Colleges in the Midwest. Forbes.com consistently ranks OBU as a top university in Oklahoma and the Princeton Review has named OBU one of the best colleges and universities in the western United States for 10 consecutive years.